Please read the Rules and Instructions and if you have any questions contact the Corktown Historical Society at corktownhistoricalsociety@gmail.com​. Entry Applications must be received no later than 5pm on Friday, November 30, 2018. Contest is for ​exterior​ decorations only, including decorations in windows that are visible from the exterior. Judging will be done from outside the residence only. Judging will be based on “curb appeal” as viewed from the street only. Therefore, only those decorations located on the street side of the property will be judged (corner lots will be judged from both streets). Judges will not enter the property to view back or side yards. 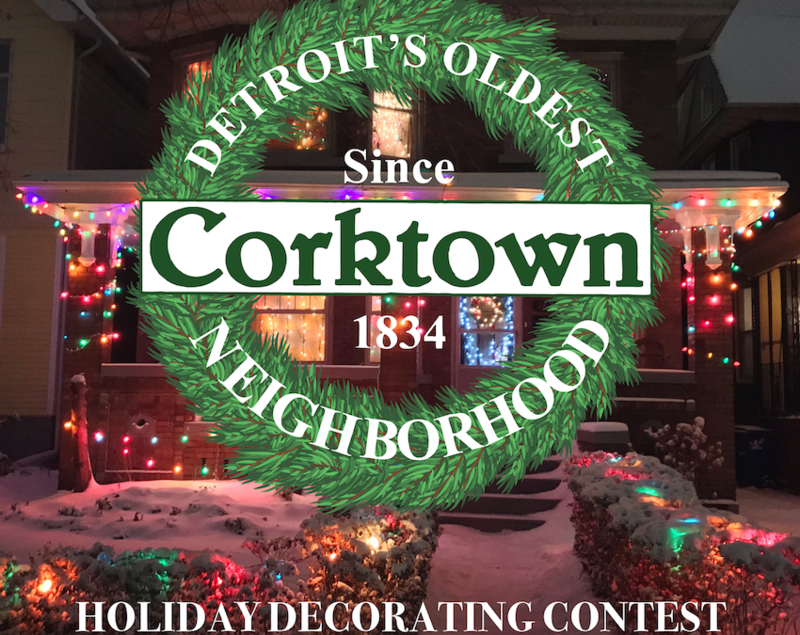 Participants agree to allow the Corktown Historical Society to take one or more photos of their decorated residence exterior and post it on the Corktown Historical Society website and/or Facebook and Instagram pages. Judging criteria will include [a] Unique design and creative use of lights and decorations; [b] Storyline or theme; [c] Display and placement of decorations, animated objects, etc. ; and [d] Overall presentation. Judging will be done from 6:00pm to 8:00 pm on Wednesday, 12/05/18. Depending on the number of entries, judging may continue from 6:00pm to 8:00 pm on Thursday, 12/06/18. All judging will be completed no later than 8:00 pm on 12/06/18. Participants should ensure that all lights, animations and decorations are in place and activated for the judging periods on both nights. An ​Entry Number Card​ will be provided to each participant. This card must be affixed to the exterior of the residence in a conspicuous place where it can be seen by the judges from the street. A ​Yard Sign​ stating a brief history of the home will be loaned to each participant along with a printed copy for their personal use. This sign must be placed in the front yard for the duration of the contest once it is received. and one Community Choice prize of 4 tickets to the 2019 Corktown Historical Society Neighborhood Home Tour and Corktown Historical Society merchandise. Winners will be announced at the annual Corktown-a-Glow Tree Lighting Ceremony on Saturday, 12/08/18. Winners need not be present to win and if not present will be notified by telephone and email.